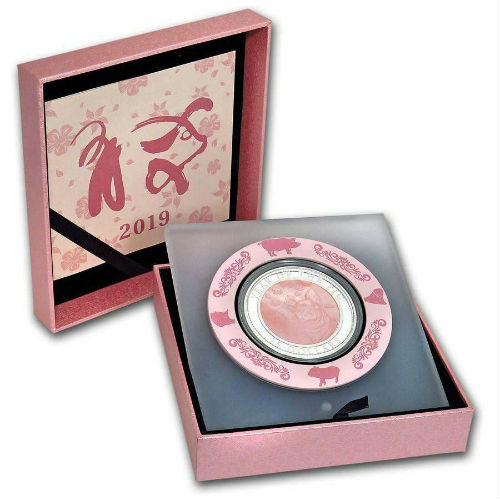 This precious piece is struck from 5 oz silver 999 in proof quality and dedicated to the eleventh of all the animals in the Chinese zodiac. Issued as part of the successful lunar series enriched with mother of pearl, this 2019 Year of the Pig coin will be an amazing lucky talisman in your collection! The worldwide mintage is limited to 888 pieces. 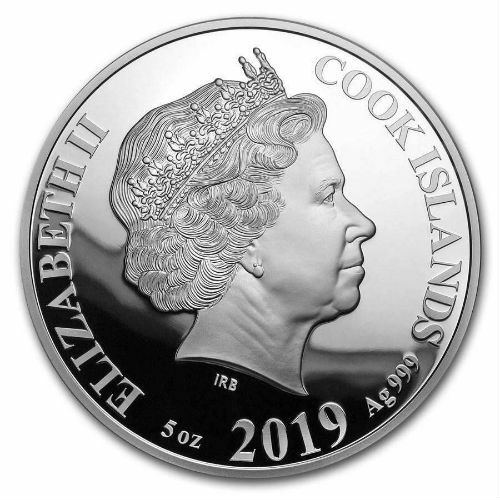 Represented on the obverse of this coin, there is the effigy of Her Majesty Elizabeth II. 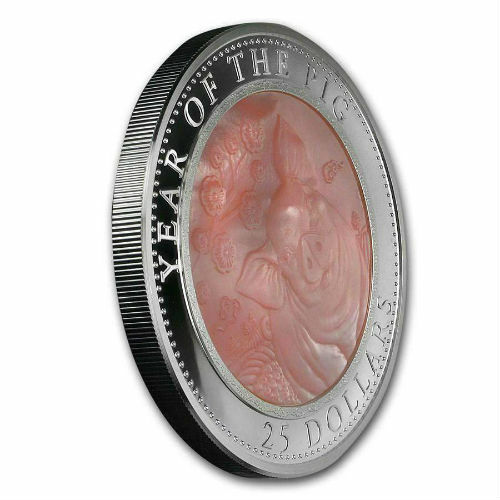 The inscriptions indicating the Queen’s name, the issuing year and the name of the issuing country can be seen along the rim of the coin. 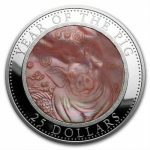 The reverse of this Cook Islands coins is truly stunning and features the refined and intricate depiction of a pig highlighted by genuine Mother of Pearl. 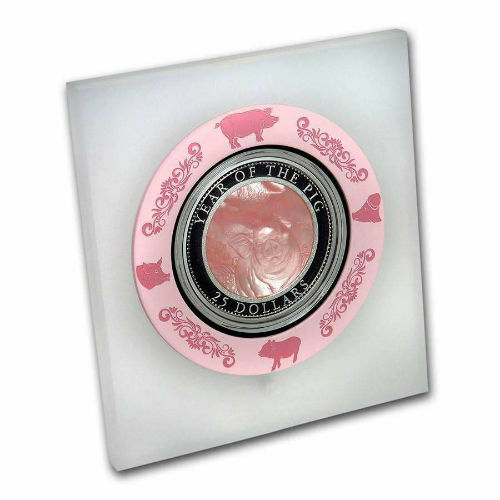 This mother of pearl pig coin comes housed within a beautiful packaging with a numbered CoA – a beautiful gift for someone born in 2019 or any other Pig year! Incredible design with finest relief on unique material “Mother of Pearl” in pink. Impressive Diameter of 65 mm! 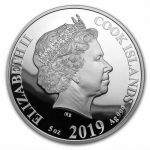 Silver coins are minted to the highest quality “Proof”. 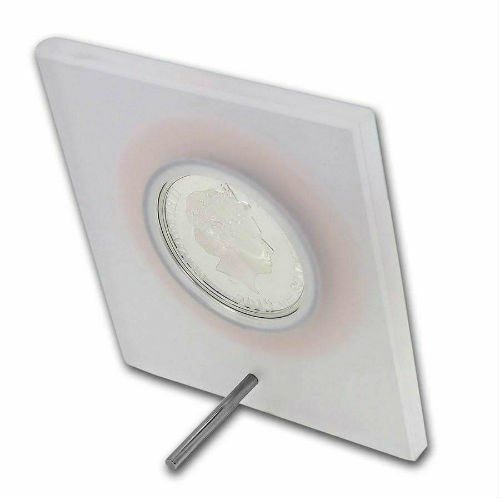 Unique packaging with a high-quality acrylic block and a numbered Certificate of Authenticity.